#6… This is my sixth article on life, death, grief, and signs. To make sense of the journey I propose for you, I recommend that you, please, step through my articles in order. They may be found at https://thegrieftoolbox.com/users/jamiepaulwesseler I make this recommendation only because it is the journey this non-believer made to arrive where I am today in my belief and faith as to what happens to us when we die. I am afraid that if you do not gradually grow into the knowledge of NDEs, the well documented happenings and studies may seem hard to accept… at least they would be for this author if I were dropped into the middle of what I will present to you over the next two months. I am so grateful of those who have shared their personal NDE journeys and of the professionals who have risked the wrath of their professions to share their findings. Each and all of them have given me the ultimate of gifts… faith and hope. And as I mentioned in my previous writings, without faith and hope of what has become of our lost loved ones, our souls will perish – of that I am certain. My wife, Susan, and I sat on our porch discussing the dreaded decision to sort through the storage tubs of Patrick’s childhood toys, books, writings, and assorted belongings in the garage. The large plastic tubs contained so many mementoes, and who could possibly decide to throw away any of it, but we felt the time had arrived to broach the subject. For years, “the tubs” occupied so much garage space. About an hour after our tearful discussion, I headed for the garage… I just had to be alone in the presence of Patrick… as best as I could, by “the tubs” – our last repository of his earthly presence… the altar we had built in remembrance of our one and only son, besides the memorial dedicated to him on my writer’s desk… where nearly every picture, card, letter, and printed e-mail I could find of or from him are placed front and center on my old wooden writer’s desk… my heaven on Earth and I shared it with our son... as I do to this day. I looked over at the tubs and, to my surprise… or maybe not, inside and against the window over and next to the tubs fluttered a large yellow swallow-tailed butterfly! Now, the garage had and always was a closed garage… no insects appeared to have entered of any unusual consequence (no other butterflies or even a moth), but on the inside of the very window overlooking Patrick’s personal belongings – his childhood toys, his books, his most cherished belongings -- was a large yellow swallow-tail butterfly! Eight windows encircled that garage… but He fluttered not in any of the other seven windows but in the one window over his treasures! What are the chances of such a thing occurring?!! Even getting into the building would have been a miracle of its own! And a swallow-tail… not a Monarch, or one of those small and friendly brown or orange butterflies, not a wasp, not a bumble bee… but one of the largest and most brilliant swallow-tails I had ever seen! I couldn’t help myself: I had gone out to the sanctuary to be alone with my son, and he had, somehow, arrived there also! I had to hold him; I had to take in every moment I could; I had to bathe in this moment given to me by my son and this god I had such an uncertain opinion of. That beautiful being was of our son… it had to be! After the wedding sign and the Pappy happenings, this butterfly was of the soul of Patrick or under his spiritual guidance… no doubt in my mind then or to this day. I needed to and was going to meet my son’s soul near his belongings, and he decided to appear and be there with me as well. I knew yellow swallow-tails were not like some friendly varieties of butterflies that will walk onto your finger or hand – they fly off with the least bit of movement toward them. I have never been able to get close, for long, to a swallow-tail butterfly. But, without hesitation or a moment’s doubt, I spoke to him and so prayed that he would acknowledge me by not flying away… I asked him, Patrick… I called him by name, to climb on to my outstretched hand. Without any additional effort on my part, he did exactly that! I was absolutely in shock. Never before had I ever held a swallow-tail butterfly… I would have sworn it to never be a possibility, but I suppose signs to be exactly what they are… miracles. I did my best to keep the butterfly on my hand by being slow and steady with my movement away from the window. I reached into the pouch for my cell phone with my left hand and called Susan to have her come out to the garage to witness a miracle. You should have seen her face when she entered the garage. Imagine being given a reunion with your lost loved one… that one chance to embrace his soul, be in his presence for at least one final good-bye, to know they are with you, and that is exactly what Susan and I shared. No other possibility existed: We were in the presence of Patrick. I mentioned last week that I have pictures to prove this tale. To follow are those pictures. In the first one, the tubs are behind me to the left; the window is to the right. 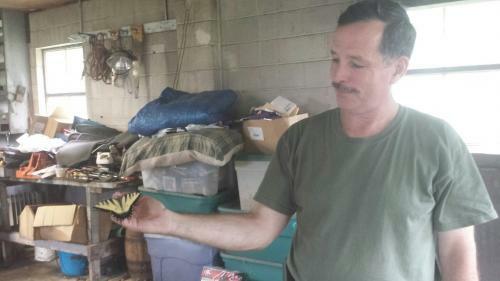 The second picture is a larger shot of that magnificent butterfly. It did not fidget, move around on my hand, or threaten to fly off, even while Susan opened the door, came near us, took my phone and snapped the pictures! This was not an ordinary swallow-tail butterfly… it was of our son. I no longer recall how long the three of us took in one another. But I do know he never left my hand… never, until we were led to a very symbolic decision, or so I have come to recognize the sequence as metaphorical today: We did not want our time to end. We wanted to keep him, the butterfly… our Patrick… or the butterfly directed by his soul forever! But to do so would mean his eventual death. We did not know how to keep and feed a butterfly. And even if we were successful at doing so, should such a beautiful creation/soul be held captive by us for our needs when it had its wings to travel the world, to be free, to journey where it should… to do as a butterfly must do? As much as I (and Susan) miss Patrick, if I am to believe as I believe in this other realm of which so many have shared with me… as our son has shown us, his soulful mission with us had come to an end and he has a new mission elsewhere… maybe on this planet, maybe on another… but he completed his mission here before we did. (Poor planning on our part, as we prefer to have been the first to leave, but that was not our call.) Yes, we love him; we would take him back in a heartbeat. But, if our desire to hold on to him would have caged his soul… killing him in another sense, then how wrong would that be? And even if we were successful at doing so, should such a beautiful creation/soul be held captive by us for our needs when it had its wings to travel the world, to be free, to journey where it should… to do as a soul must do? 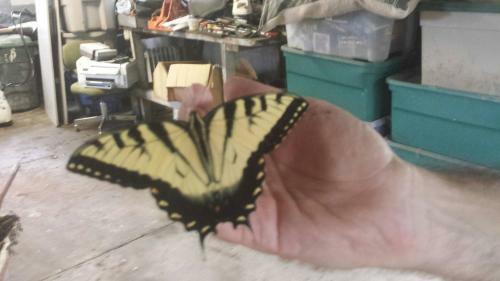 He remained on my hand even when we opened the overhead garage door. Tears rolled down our faces… we gave him a thank you, a good-bye, and only after I had stepped over the threshold did he launch into the air with a slight toss of my hand. Patrick, our butterfly, flew off into his world, again, to do as a soul must do. Jamie Wesseler and his wife, Susan, lost their 31 year-old son, Patrick, in an auto accident in 2014. Through his writings for The Grief Toolbox, Jamie shares the soulful journeys he and his family have experienced before and after their loss. The spiritual journeys include true tales of near death experiences (as told to the author... what awaits us on the other side), interactions between a 15 month-old and her deceased uncle (the two had never met in life), a series of documented Tiger Swallowtail butterfly sightings (recurring signs from the other side), and an archaeological mystery of the sacred circle mound complexes built by the Hopewell culture of the Native North Americans at the time of Christ's birth (what may have inspired a cultural Renaissance just may be proof of a divine happening). Jamie's first novel, Where The Birds Go When It Rains, serves yet as another source of inspiration, hope, and insight for those of us who have lost a loved one -- a novel based on the life events shared with The Grief Toolbox family and the 1968 excavation of the sacred circle mound on the Bertsch farm north of Cambridge City, Indiana. As he writes in his tale... and personally uses as a source of strength through his healing for his loss of Patrick, "With the knowledge and presence of the circles, may you always have cause to possess faith. With "this" story (that of his first novel), may you always have cause to possess hope... faith and hope in the darkest of hours, if and when those moments arrive.